ONI Bureau: Good Evening Readers! Here are the Odisha Evening News Headlines today by Odisha News Insight. — Balangir: Anganwadi worker abducted by four miscreants in Kantabanji area. — Illegal mining: Odisha cancels licenses of 6 leaseholders after they failed to pay the stipulated penalty. 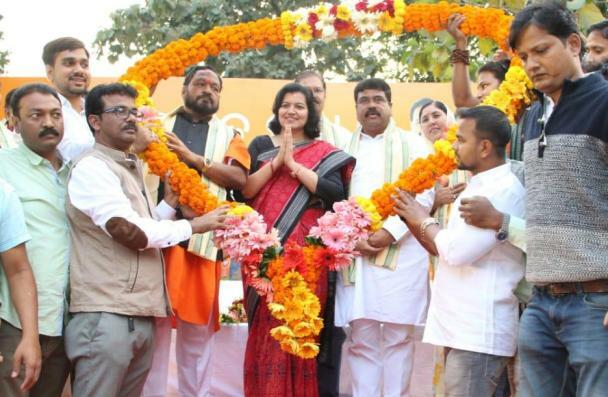 — Former Odisha-cadre IAS officer Aparajita Sarangi felicitated at BJP office in Bhubaneswar. — Reshuffle of IAS officers: Ashok Meena appointed principal secretary of Finance department; Debendra Kumar Jena appointed as MD of Odisha State Cooperative Bank, Girish SN secretary becomes special secretary of GA & PG department. — With an aim to create awareness among motorcyclists, Commissionerate Police distributes helmets near AG Chhak in Bhubaneswar. — Man gets 4-year jail term for thrashing his mother in Purunadihi of Baripada. — A woman jumps off Kuakhai River bridge; rescued in critical condition by locals. — 7-member fact-finding team of Odisha unit of BJP to visit Beltikiri in Dhenkanal tomorrow.